Last week, much time with my family was spent discussing how we would all be classified. 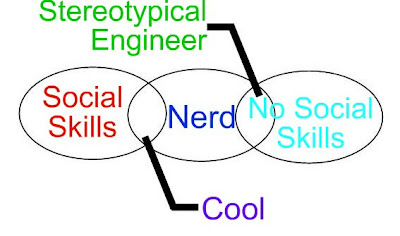 Can nerds be cool? 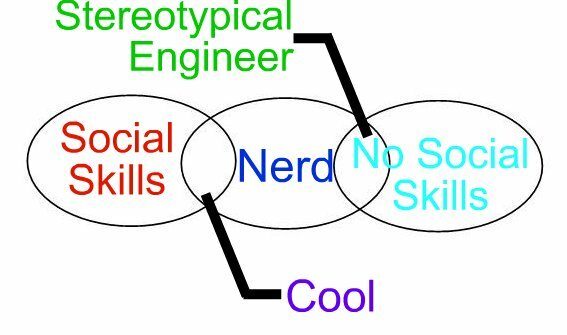 What separates a "cool" nerd from Sheldon on "Big Bang Theory"? 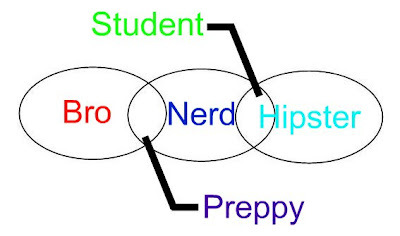 What do bros and nerds have in common? These questions are all answered. This time in ovals! Bros and nerds don't agree on much... but they can both get behind a good pair of khakis and a polo shirt. My coworker calls it the "engineer's uniform." I call it "dress code at the prep school I attended." We are finding common ground here, people. Similarly, if you're a hipster, it's not cool to act like you like knowledge. That's not ironic at all, dude. Not like that mullet and molester 'stache. An exception can be made if you're a student... then rock the nerdiness! Just don't act like you care. Engineers? Not very cool. They don't make eye contact and constantly correct you. Accuracy, not human connections, is what's important. They will talk at you and wonder why you look lost after thirty minutes on the molecular details of stormwater treatment. Smart people, though? Super cool. Especially when they are self-proclaimed nerds who can still hold a conversation. Those people are the best. Once I finish this exercise in visual representations of elementary set theory, maybe I'll go be cool. 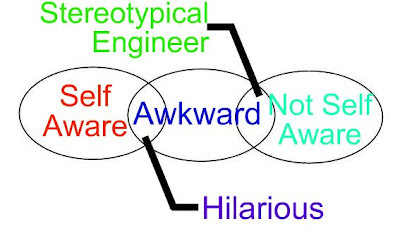 Wondering why you don't have any friends, my engineering peers? It's because you're awkward. 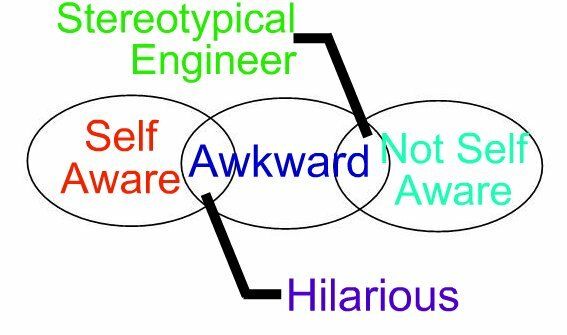 That would be fine, except that you don't realize you're awkward. You have conquered handshakes and taught your mouth to smile, but you're standing too close with your horrible coffee breath, and I'm pretty sure you just called that girl fat and stupid. It is horribly uncomfortable to be around you. Learn to recognize the signs of other people's discomfort and make a joke about yourself, and then you can join the ranks of stand-up comedians. Once you do that, it will be your job to call that girl fat and stupid. Uh, you still might have no friends, though. Just fans. It looks as though I am going for the world record in longest caption. Wish me luck with that! Also, where do YOU fit on the circles? If you don't know, the answer is awkward and not self aware. Just FYI. I fit anywhere it says "hilarious," "cool," or "awesome." You should make one that includes "awesome." Also one that includes "humble," because that will be the most me. I'm having trouble commenting here because your ego seems to be taking up all the space. It does expand to fill all available volume.